A talk show for metalheads, about metalheads, by metalheads. Great show for metal heads! If you're into hard rock and heavy metal - this is the show for you. Two comedians and a hard rock nerd host this show and are joined by great rock and roll guests, e.g. Axl Rose, Ace Frehley, Lemmy, Slash, Lars Ulrich and the late Ronnie James Dio. The show has evolved during the years and has been a masterpiece since about season seven. 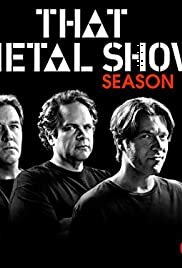 That Metal Show (aka TMS) is like Dave Letterman but with funnier hosts and better guests. People in the USA can watch for free on VH1's site, it's available for download here and there(...) for the rest of us, Check it out!